Nacho chips smothered with ground beef, beans, and melted cheeses. served with lettuce, sour cream, and guacamole. jalapenos upon request. 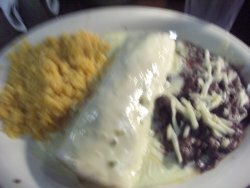 10 inch flour tortilla smothered with melted cheeses and your choice of shredded beef, ground beef, chicken or cheese. Served with lettuce, sour cream, and guacamole. 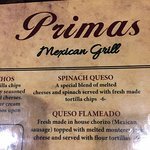 Or shrimp for only 1.50 grilled stuffed quesadilla10 inch wheat tortilla stuffed with melted cheeses, fresh tomatoes, and your choice of chicken or steak. served with lettuce, sour cream, and guacamole. Nacho chips smothered with melted cheeses. topped with grilled bell peppers, onions, and your choice of chicken or steak. served with sour cream, guacamole, and lettuce.jalapenos upon request. Special blend of melted cheeses and spinach. Chorizo (Mexican sausage) topped with melted monterey jack cheese. 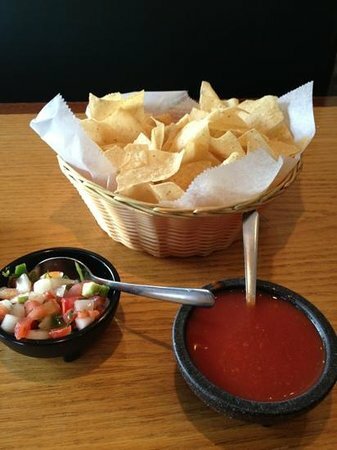 served with flour tortillas. Our special blend of melted cheeses and mild spices. Your choice of chicken, ground beef, or shredded beef, lettuce, tomatoes, and sour cream all wrapped in a 10 inch flour tortilla. smothered in queso sauce and served with rice and beans. Steak tips and grilled onions wrapped in a 10 inch flour tortilla and smothered with enchilada sauce and melted cheese. served with rice and beans. 10 inch flour tortilla stuffed with your choice of chicken or beef (shredded or ground). Deep fried to a golden crisp and smothered with enchilada sauce and melted cheese. Served with rice and beans. Seasoned ground beef wrapped in a 10 inch flour tortilla. smothered with enchilada sauce and melted monterey jack cheese. served with rice and beans. White fish fillet pieces sauteed with cilantro, onions, tomatoes, and peppers. served in three flour tortillas topped with lettuce, tomatoes, and monterey jack cheese. served with rice and beans. 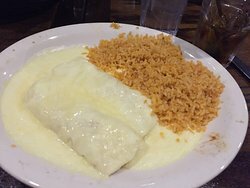 Two​ flour tortillas filled with shrimp and cheeses, smothered with a light cream sauce. served with rice and beans. Mixture of shrimp and cheeses wrapped in a 10 inch flour tortilla then deep fried to a golden crisp. smothered with our light cream sauce and melted cheese. served with rice and beans. Sauteed shrimp with spinach smothered with a roasted creamy queso sauce. served with tortillas, rice, and black beans. 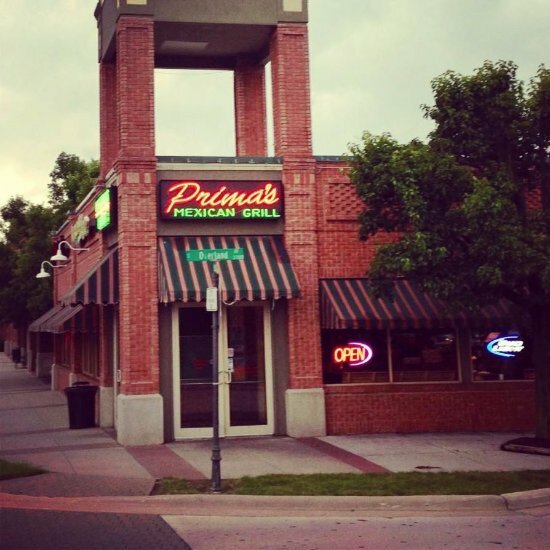 Three enchiladas with your choice of ground beef, shredded beef, chicken, or cheese smothered with primas’ signature enchilada sauce and topped with melted cheese. served with rice and beans. 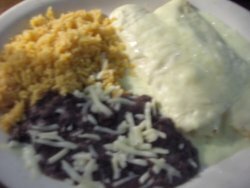 Three flautas with your choice of chicken or shredded beef topped with guacamole, lettuce, tomatoes and cheese. Served with rice and beans. One chicken flauta, and one taco. served with rice and beans. 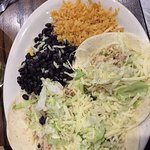 Three tacos (hard or soft flour) with your choice of ground beef, shredded beef, or chicken. served with rice and beans and topped with lettuce, tomatoes and cheese. One chicken flauta, bean tostada, one homemade tamale, one taco, and one cheese enchilada. served with rice and beans. Seasoned grilled chicken sauteed with squash, onions, bell peppers, and tomatoes. served with rice, beans and flour tortillas. 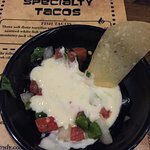 Grilled chicken breast topped with pico de gallo and white queso sauce. served with rice. Seasoned grilled chicken and spinach sauteed to perfection. wrapped in two separate flour tortillas and smothered with our san miguel sauce and melted monterey jack cheese. served with rice and beans. Grilled chicken breast smothered with ranchero sauce, sauteed bell peppers and onions. topped with melted monterey jack cheese. served with rice and beans. Three chicken enchiladas topped with our signature sour cream sauce. served with rice and beans. Two homemade tamales topped with pico and smothered in queso sauce. served with rice and beans. Three homemade pork tamales smothered with enchilada sauce. served with rice and beans. Your choice of steak or chicken with grilled onions. baked in a flat bread smothered with cheese and a creamy roasted pepper sauce filled with lettuce and tomatoes. served with sour cream and guacamole. A deep fried 10 inch flour tortilla bowl filled with lettuce, tomatoes, cheese, sour cream, and your choice of ground beef, shredded beef or chicken. A deep fried 10 inch flour tortilla filled with grilled onions, bell peppers, lettuce, tomatoes, and cheese. 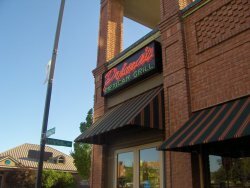 topped with fresh avocado slices and your choice of grilled chicken or steak. Crispy lettuce, tomatoes, onions, cheese, and bell peppers. topped off with grilled chicken breast and shredded cheese. served with your choice of dressing. Marinated chicken breast slices on a bed of lettuce with onion slices, tomatoes, and cheese. topped with pineapple slices. served with your choice of dressing. One cheese and one ground beef enchilada smothered with enchilada sauce and melted cheese. topped with lettuce, tomatoes, and shredded cheese. A 10-inch wheat tortilla stuffed with grilled onions, bell peppers and a touch of ranchdressing. your choice of chicken or steak. Seasoned chicken breast served on a hoagie bun with lettuce, tomatoes, and mayonnaise. served with french fries. Seasoned black angus beef patty dressed for success. served with French fries. An 8oz. flank steak cooked just the way you like it. served with a dinner salad and French fries. A 6oz. blackened chicken breast seasoned and grilled to perfection. served with a dinner salad and French fries. Shrimp sauteed in house seasonings with bell peppers and onions. served with a dinner salad and French fries. Margarita house gold tequila mixed with our special sour mix. Cuervo gold, grand marnier, and sour mix on the rocks. Jose cuervo traditional tequila, triple sec, amaretto, and sour mix. Choice​ of top shelf tequila, grand marnier, and our special sour mix. Jose cuervo gold tequila, triple sec, razzmataz, strawberry, and sour mix. Frozen margaritas blended with your favorite tropical flavor. choice of strawberry, peach, raspberry, or mango. كان موعد بابا مع ابنتى 2. وكان queso المعلقة. رقائقهم وسلسا كبيرة كذلك. يتميز مطعم burrito الخاص بالمطعم بأنه كبير وفخم. الخدمة كانت رائعة كذلك. مارغريتا كان مثاليا. توقفنا لتناول طعام الغداء في هذا المطعم المكسيكي. وقوف السيارات خلف المبنى وهناك مدخل خلفي. خدمة سريعة وودية ، chimichangas كانت كبيرة ولذيذ جداً مثل الفاصولياء والأرز التي جاءت مع chimichangas. الطعام مذهل وخدمة رائعة !! أنا وزوجي يأكلون هنا مرة واحدة على الأقل كل أسبوعين. ومن الأيدي أفضل الطعام المكسيكي في سبرينغفيلد. عادة لا يكون هناك انتظار طويل جداً والمالك حلو جداً. الغذاء رائع ولديهم الكثير من بيرز ومارغريتا مختلفة. هذا هو مكان واحد لا تريد أن تفوت. ايم من سو. كاليفورنيا إذا كان لديه أي قيمة forMx.food. انها جيدة جدا! هذا الموقع بالذات لديه موظفين يقظين للغاية وخدمة ممتازة. رقائق خفيفة ، هش وطازج. يمكن ترقية السالسا إلى الساخنة؟ مصنوعة من أجل ريليلين شيلي ممتازة. موقع آخر لم يكن جيدا. استمتعت بهذا المكان كثيرا. وكان الخادم المهنية ومهذب للغاية. كان queso جيد جدا جدا! أنا أحب بلدي السالسا spicier قليلاً ولكن كان حسنا. كان العشاء الخاص بي جيد جدا. تشيلي ريلينو كان ممتازا! 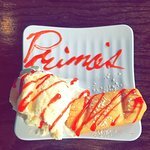 احصل على إجابات سريعة من موظفي ‪Primas Mexican Grill‬ وزوار سابقين.